There always have been, and there will always be, those who long for the way baseball used to be. In many ways, I’m also a member of the Good Old Days Club. I miss a lot of things about the old days: the quirky and unique stadiums, the colorful personalities, the day games, the varying offensive strategies, and more. But I’m always willing to look at the facts to see if the old days really were better. Most of the time, they were not. The years of segregation kept many of the best players out of the game. 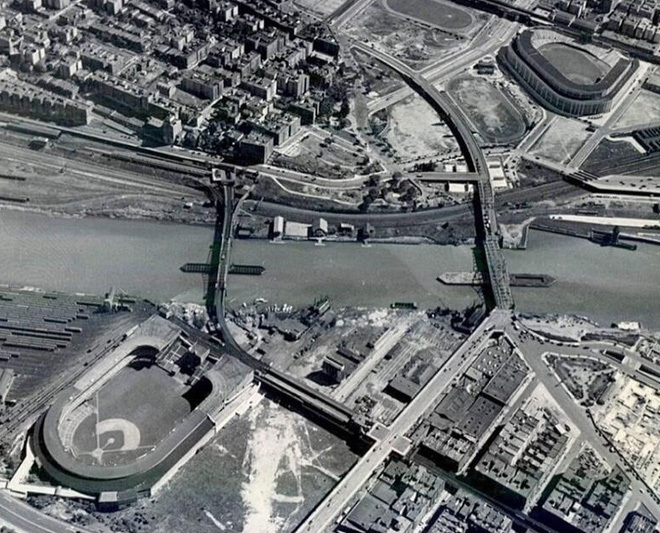 The quirky urban ballparks made a lot of players look much better (e.g. Chuck Klein) or worse (e.g. Goose Goslin) than they really were. Contact hitting turned out to be overrated in terms of run production, and the alleged damage done by a batter’s high strikeout rate turned out to be greatly exaggerated. The tried-and-true strategies like sacrifice bunts turned out to be often tried, but rarely true. And then there was the mystique of the complete game. Since the dawn of professional baseball, each generation of pitchers and fans has lamented the decline of character in the next generation of pitchers. Today’s old men harken back to the iron arms of their youth in the 1950s and 1960s, when mighty combatants like Warren Spahn and Bob Gibson would finish what they started. 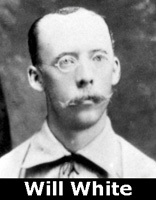 Spahnie pitched 382 complete games and led the league nine times, including seven in a row. And none of those seasons were his most impressive, in which he completed 24 games in 32 starts. Gibson once had back-to-back seasons of 28 complete games, and didn’t even lead the league in the earlier of the two, when Juan Marichal completed 30. But it’s important to realize that the old men sitting in the stands in the 1960s thought the pitchers of that day were soft. They would lament the passing of the true warriors of an earlier time, men who would complete almost all of their starts while also making relief appearances as needed. 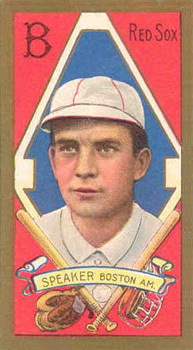 Happy Jack Chesbro completed 48 games one year, while many others of his time topped the 40 mark, including Cy Young and the aptly monikered Iron Man McGinnity. To hear those old fellas talking in the stands in 1960, why ol’ Walter Johnson would complete 38 games in a season while throwing hundreds of pitches in each contest, all of which surely must have been traveling 110 miles an hour. And yet when Jack Chesbro was on the mound in 1904, tossing his 48 complete games, there were old men in those stands as well, and they would remind each other of the 1879 season when Will White started 75 games for the Cincinnati Reds and finished every single one of them. Upon hearing that, another of the old-time “cranks” in those wooden stands would argue that White was OK, but Old Hoss Radbourn was a real man. 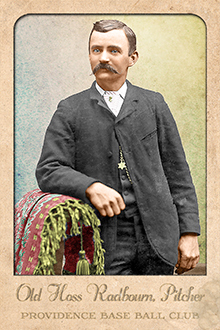 He not only completed all 73 of his starts in 1884, but won 60 of them. (Or so they thought until recently. We now know that the correct number of wins was 59.) Moreover, the Old Hoss was virtually the team’s only pitcher from July 23rd on. He not only completed his regular starts, but also took everybody else's turn in the rotation, and completed those as well. During one stretch between August 9th and September 24th, Rad started 28 of the team’s 29 games, completing every one and winning 24. None of the all-time records for complete games will ever be challenged. You may discount Will White’s single season high of 75 because he was pitching underhand from 45 feet. You may disallow Old Hoss’s season of 73 complete games because it was still from the old pitching distance. And feel free to be a skeptic and toss out Amos Rusie’s season of 50 complete games, which is the record at the modern pitching distance, because it was in the deadball era. Fine. Now you are still left with the fact that Bob Feller threw 36 complete games in a single modern season. No pitcher will ever approach that again. Max Scherzer led the NL in 2017 with two complete games. The career record is even more daunting. Cy Young threw 749 complete games in his career. The active career leader, as I write this, is CC Sabathia with 38 complete games in 17 seasons. Young’s total of 749 is the least approachable record in all of baseball. Do you think that’s exaggerating? Consider this: it is very unlikely that any current or future pitcher will reach as many as 75 complete games in a career, so it is literally true that from now on nobody will reach even 10% of Young’s total. I can’t name any other record that far out of reach: not the DiMaggio hit streak, the Ripken playing streak, Cy Young’s 511 wins, nor Nolan Ryan’s 5714 Ks and 2795 BBs. Some of those records are assuredly safe, and the others are unlikely to be broken, but modern players can easily get within 10% of them. But Young’s CG total will probably never be matched or topped again even if baseball's high sheriffs add a decimal point and make it 74.9 complete games! So is the decline of complete games a bad thing? If pushing a starter to finish his games was the winning strategy, people would still be doing it. In extra innings, opposing hitters achieved a .706 OPS, and their K frequency dropped to 6.1 per 9 innings. The average NL batter during Gibson’s career (1959-1975) had an OPS of .693 against all pitchers so, as the game progressed, Gibson came closer and closer to an average level. Of course it was not feasible to pull Gibson for another rotation starter, so a mathematical average of performance against all pitchers is not indicative of who might have been able to relieve. Relief pitchers were often failed starters in that era, as opposed to relief specialists, so they were slightly less effective than average, allowing batters an OPS of .703 over that same span of years. But note that Bob Gibson's performance in extra innings was even slightly below the level of an average reliever of the era, suggesting it was far below the level of the best relievers. Leaving Gibson in to complete a game in extra innings was rarely preferable to bringing in the best available reliever. The overall decline of Gibson’s performance over the course of a game is vividly illustrated by the following graph of Gibson’s strikeout-to-walk ratio, inning by inning. 2. Gibson was a great pitcher overall, but his platoon splits were astronomically large. First let us give him his due, and that due is substantial. In the entire history of major league baseball since the dawn of the lively ball era, among all pitchers who have retired 3000 or more right-handed batters, there has never been any pitcher more effective against right handers than Bob Gibson. Never. Not one. No starter. No reliever. The top 25 are shown below. Footnote: a great Houston fireballer, J.R. Richard, was slightly more effective than Gibson, but fell below the specified threshold of batters retired. Gibson did beat everyone else who is off the chart, including Mariano Rivera. 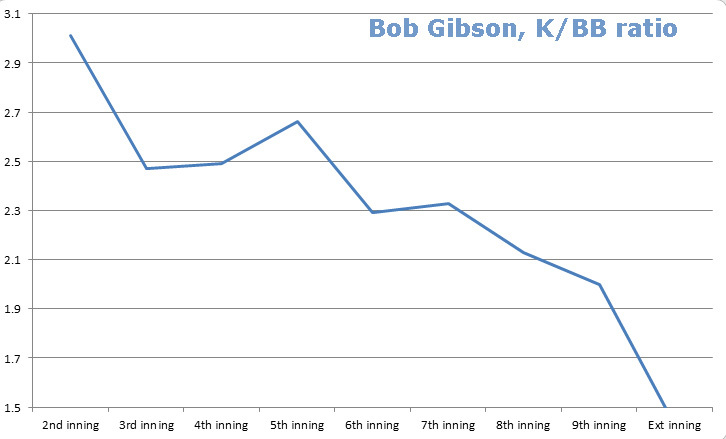 The following is a rundown of the batting averages of the greatest right-handed hitters of his era against Gibson. 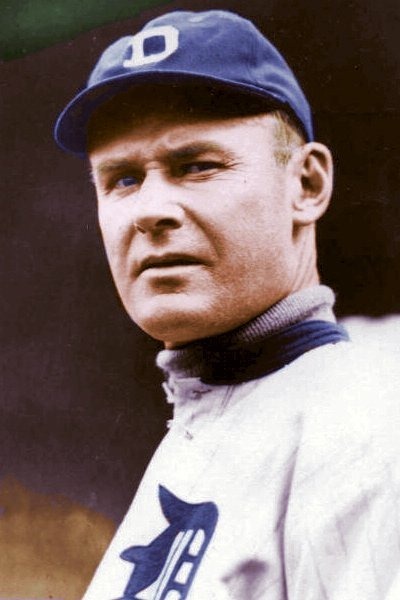 If you are a thoughtful fan and have been following the article closely up to this point, you are probably wondering something like this: "If Gibson was the best pitcher of all time against right-handed batters, and so many batters are right-handed, why is he not considered the greatest pitcher ever to toe the rubber?" The answer will probably surprise you. Against left-handed batters, Bob Gibson was an average pitcher. Please note how I worded that. I didn't say "he wasn't as strong against lefties" or "he was less successful against lefties than against right-handed hitters." The harsh reality was that he was just an average pitcher against left-handed hitters. Even more important when considering in-game strategies, even an average left-handed pitcher was FAR more effective than the right-handed Gibson against left-handed batters. In general, a manager would be far better off by pulling Gibson and bringing in even an average left-handed pitcher to face a left-handed batter. This would obviously not happen in an early inning, since Gibson would still be needed to pitch to all those right-handed batters still to come. But in a late inning, or extra innings, in a clutch situation, Gibson obviously should have been pulled for a lefty reliever against a tough left-handed hitter, for two reasons: (1) he tired significantly as the game progressed; (2) even when not tired, he was less effective against left-handed hitters than the average left-handed pitcher. As opposed to the right-handed stars detailed above, many left-handed hitters hit Gibson hard. The Willies, Stargell and McCovey, each batted .290 with power. Eddie Mathews batted .326 with power. Richie Hebner batted .387 with an 1.127 OPS. Ralph Garr also batted .387. Al Oliver batted .342. Joe Morgan hit .313 with power. Billy Williams batted only .259, but with ten homers. Unheralded Dave Rader batted .484 against Bob Gibson. 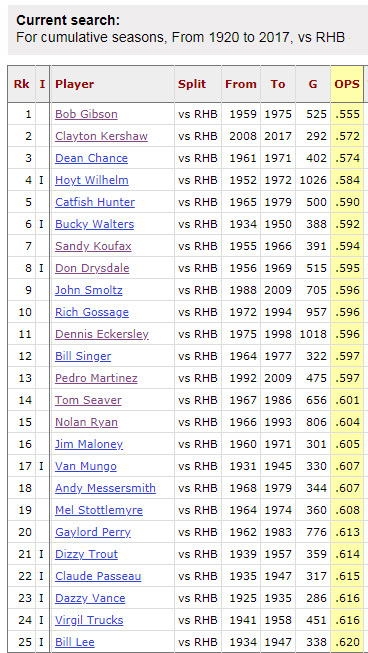 Many other lefties and switch hitters topped the .300 mark. And that, in a nutshell, is why relief specialists exist. Human beings get tired. The platoon differential is very real. Even if complete games posed no risk at all to the pitchers' multi-million-dollar arms, the modern strategy simply works better. SIDEBAR: Is Gibson an exception to the rule? Are there other pitchers whose performance indicated that they should have stayed in to complete most starts? Yes, but only one that I know of. 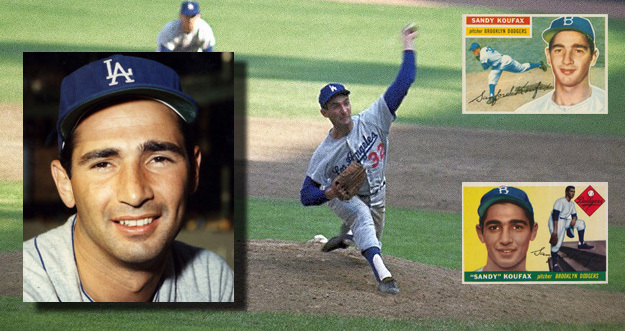 Almost all pitchers have fatigue factors and platoon differentials that make it a sound strategy to replace them in certain game situations, but Sandy Koufax did not. * He had no platoon differential at all. Although left-handed, he held right-handed batters to a .594 OPS, and stymied left-handers equally as well (.598). * He actually improved late in the game. Batters managed a .598 OPS against him in innings 1-6, but only .588 in innings 7-9. and only .492 in extra innings. There is simply no good explanation for those two bullet points above. Neither of those facts should be true, but Mr. Koufax appears to have been some kind of freak of nature. It is entirely possible that he should have pitched fewer innings, but the reasons for that would be based on kinesiology, not performance. Pulling him out of a lot of games might have saved his arm for a few more years. Or not. I don't know. But I do know that there were generally no performance-related reasons to pull him, based on either fatigue or platoon differential. Unless he asked to be taken out for some reason, he was always the guy you wanted on the mound. Since Ted Williams made his debut in 1939, baseball's hot stove has been fired by debates about whether Williams and Joe DiMaggio might have been even greater players if they had traded places, therefore landing each of them in a park better suited to his skills. Since we now have detailed information about how each player performed in each park since the mid-20s, it's easy enough to offer a reasonable guess about how this imaginary swap might have worked out. How do lefties perform in Fenway Park? 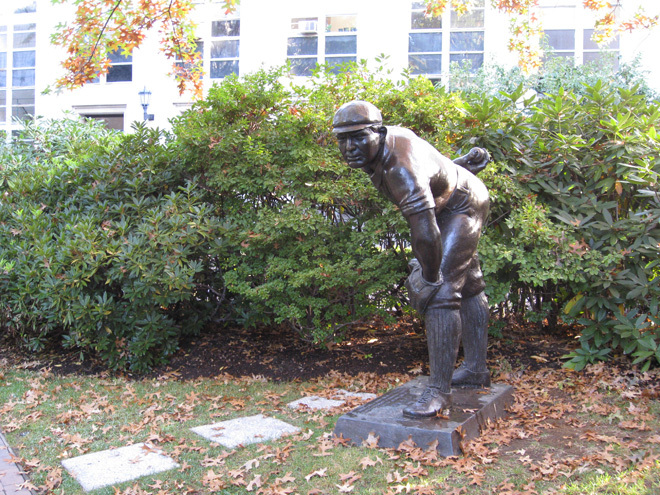 For various hypothetical reasons, people have long assumed that Fenway Park can be a difficult offensive environment for left-handed hitters like Williams. That assumption is simply not supported by facts. Every great left-handed hitter who has played for the Red Sox in the lively ball era has performed far better in Fenway than out of it. First, consider the case of two slim, elegant outfielders who played together in the 70s: Fred Lynn and Carl Yastrzemski. 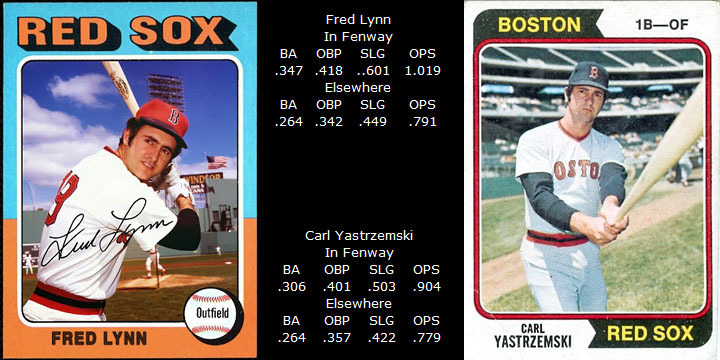 Outside of Fenway they were .265 hitters with moderate power (OPS below .800 in both cases), but they terrorized opposing pitchers in Boston, especially Lynn, who hit .347 in Fenway, with an OPS over 1.000. But the Fenway advantage is not limited to any specific type of lefty. The two big, muscular, lumbering sluggers in the group experienced the same kind of advantage. 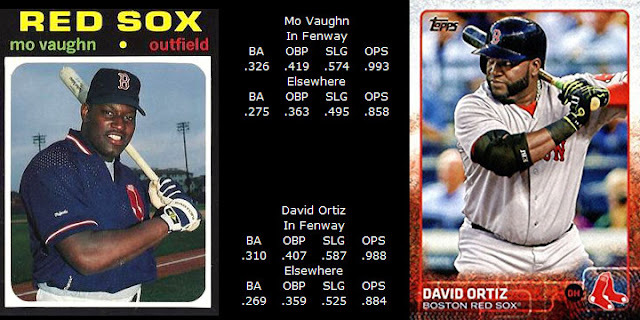 Mo Vaughn and David Ortiz were more powerful than Lynn and Yaz outside of Fenway, but still form two more examples of the lefty Fenway prototype: a .265-hitting Clark Kent transformed by Fenway into Superman with a .300+ batting average and an OPS right around 1.000. The final examples add two more types of hitters: Wade Boggs, a skillful line drive hitter who liked to use the opposite field when given the opportunity, and Ted Williams, a powerful hitter who almost never hit to the opposite field. Their stats demonstrate that Fenway enhances the production of any kind of lefty hitter. Both of these hitting machines, although polar opposites in their hitting approaches, were able to produce Fenway batting averages in the .360s. 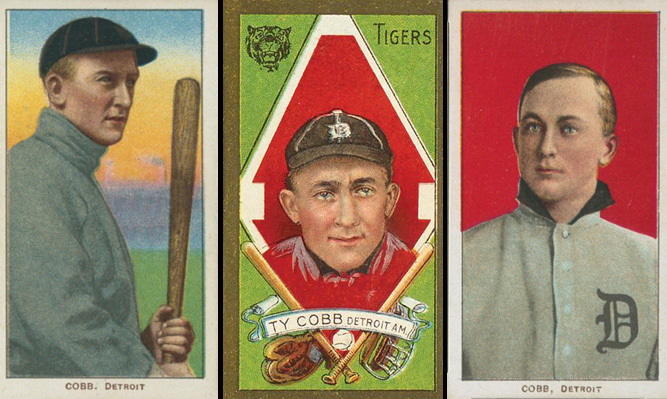 The composite of these six hitters creates a profile how how much the career of a great left-handed hitter can benefit from playing in Fenway Park. Since a major leaguer plays half of his games in his home park, a lefty who plays his career in Fenway (as opposed to a hypothetical neutral park) can expect to add about 25 points to his batting average and nearly 50 points to his slugging average. That is very close to what actually happened to Yastrzemski and Williams, who did play their entire careers in Boston. How did Williams perform in Yankee Stadium? From these batting lines we can reach some fairly accurate conclusions about how a theoretical move from Fenway to Yankee Stadium might have affected Williams's individual stats. For every 600 plate appearances (roughly equivalent to two seasons' worth of home games), we can see that only two counting stats are significantly different: Yankee Stadium would have converted some 25 doubles into walks. His OBP, therefore, would remain about the same in the hypothetical relocation, but his batting and slugging averages would suffer. I can only guess why Williams took more pitches and hit fewer doubles in Yankee Stadium. 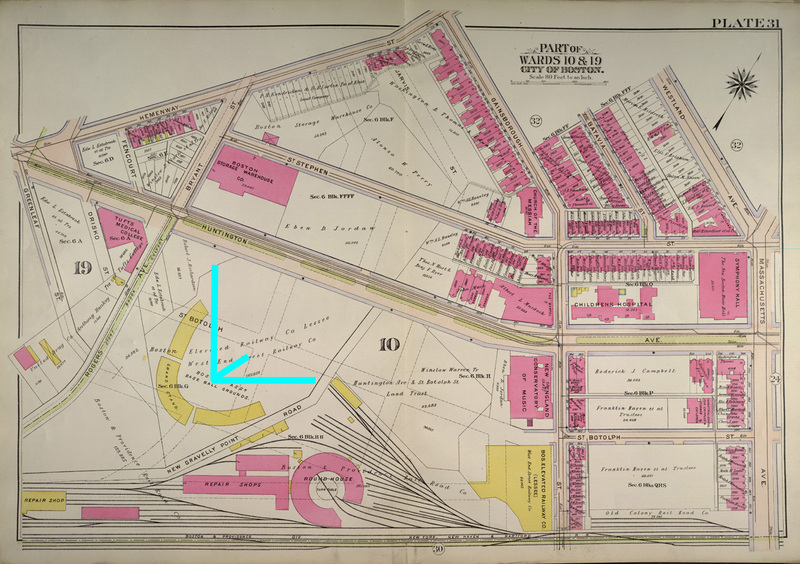 (1) While both parks had short porches along the right field line and Fenway is deeper near the line, Yankee Stadium was deeper in right center and center. 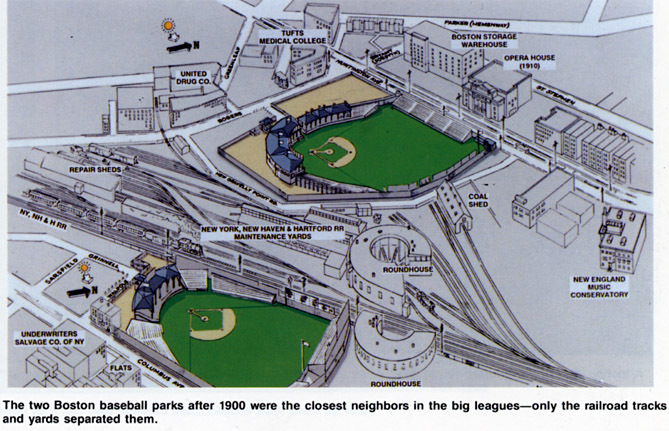 A 400-foot fly ball was always good for extra bases in Fenway, while Yankee Stadium produced many 400-foot outs with DiMaggio patrolling center. The depth of Yankee Stadium was not as traumatic for left-handed sluggers as for righties, but it gave those lefties some fits as well. 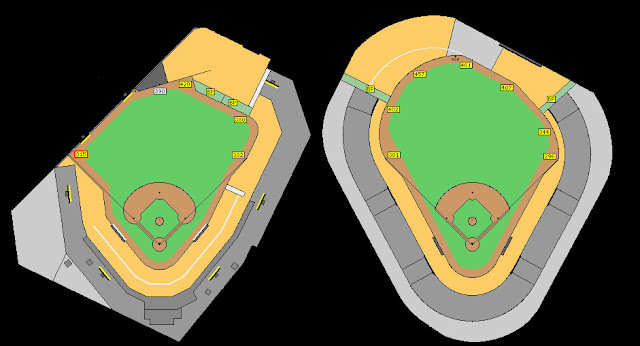 See the dimensions pictured in the illustration below, which represents both parks as they were configured in Williams' day (click to enlarge). 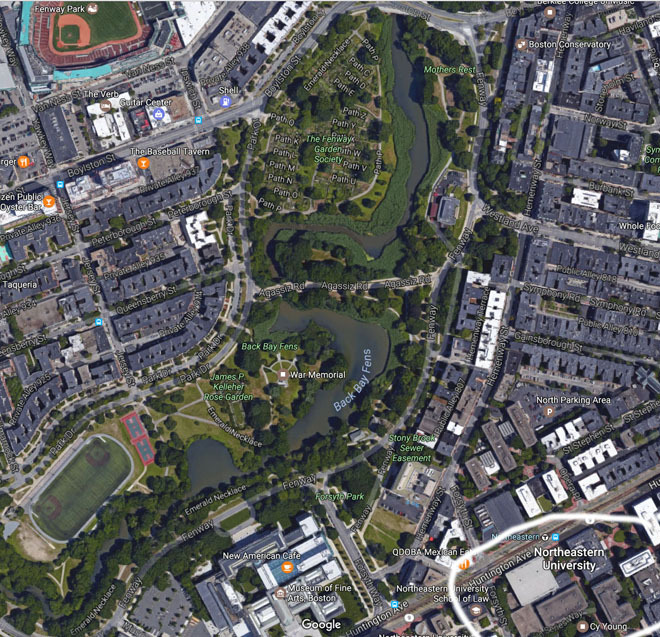 (2) Managers rarely start a left-handed pitcher in Fenway Park because of the short distances in left field. 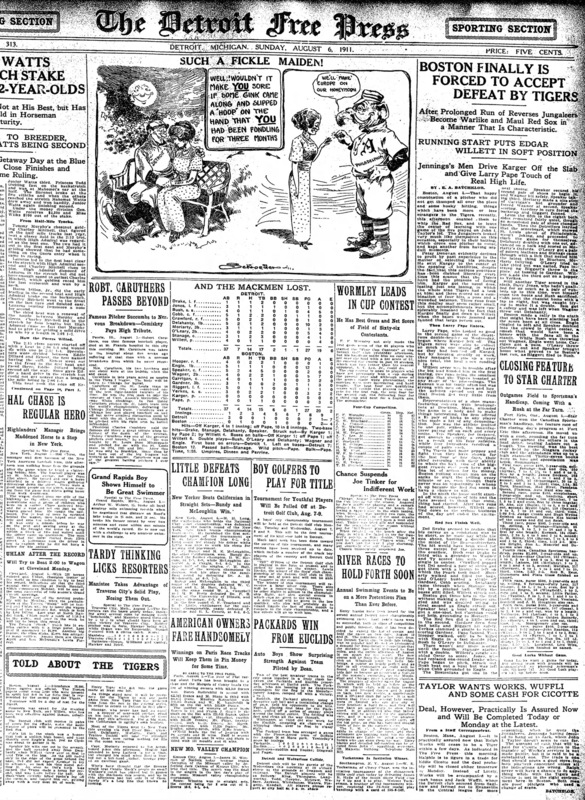 For example, Casey Stengel would notoriously skip Whitey Ford's turn whenever the Yankees traveled to Boston. From 1950 until 1960, his eleven seasons under the Ol' Perfessor, Ford started only five games in Fenway Park. Stengel knew what he was doing. During the course of his lifetime, Ford had a lower earned run average than Sandy Koufax, but Whitey's lifetime ERA in Fenway was a disastrous 6.16!! 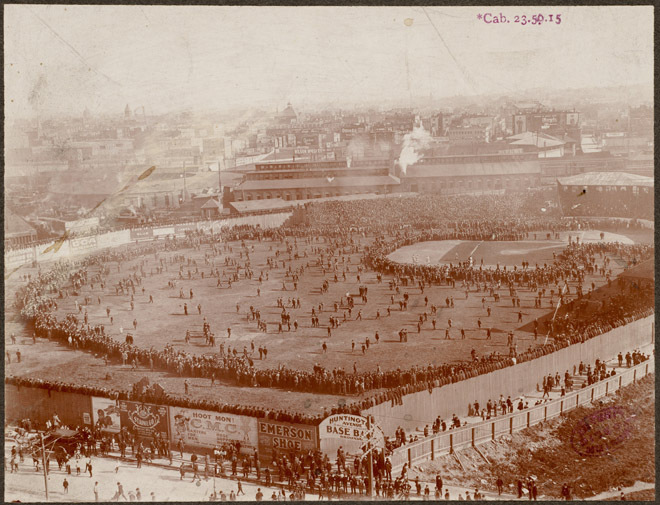 In contrast, managers loaded up their rotations with lefties to pitch in Yankee Stadium because the distant fences from right center to straightaway center made that area Death Valley for right-handed sluggers. In the 1950s, where we have complete data available (unlike the 1940s), left handers started 29% of all American League games, and 33% of the games at Yankee Stadium, but only 11% of the games at Fenway. By playing half of his games in Fenway Park, Williams faced left-handed starters in only about 20% of his career games, while DiMaggio's Yankees, playing half of their games in the Bronx, faced lefty starters approximately 31% of the time. Since a left-handed slugger would face far more lefty pitchers in Yankee Stadium than in Fenway Park, his overall performance would decline in the Bronx even if all other factors were constant. Even a great hitter like Williams was not immune to the platoon disadvantage. He batted only .318 throughout his career in games started by left-handed pitchers, versus .351 in his other games. 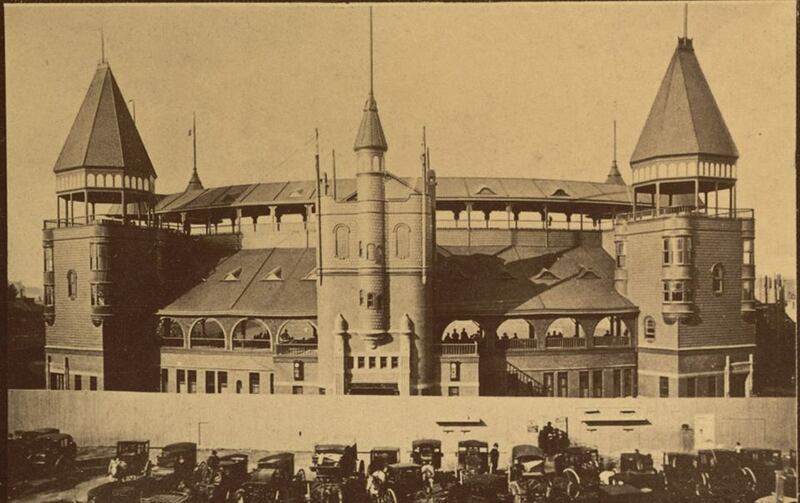 (3) Williams himself claimed that pitchers would pitch to him in Fenway because they felt protected by the the deep fence in right-center, but would always pitch around him in Yankee Stadium. He knew his game pretty well, and that explanation is consistent with the substantial increase in walks that he experienced in the Bronx. Wasn't Williams' sub-Splinter performance in Yankee Stadium just a result of having to face the great Yankee pitching staff there? Short answer: no. Long answer: hell, no. Williams didn't seem to have any problem hitting against that vaunted staff in Fenway Park. Although Teddy Ballgame's line against the Yankee pitchers in Yankee Stadium was .309/.484/.543, it was quite a different story in Fenway Park, where his line against the Yankees was off the charts, with a .375 batting average. (.515 OBP/.663 SLG). The specific differences between the two performances are much the same as Williams's overall splits between Fenway and Yankee Stadium. His home run rate was almost identical in both parks, but per 600 plate appearances, Williams drew 28 more walks at Yankee Stadium while hitting 30 fewer doubles (!!) That's not a misprint. He hit 46 doubles per 600 plate appearances against Yankee pitching at home, but only 16 in the Bronx. Overall, how would the move have affected Williams? 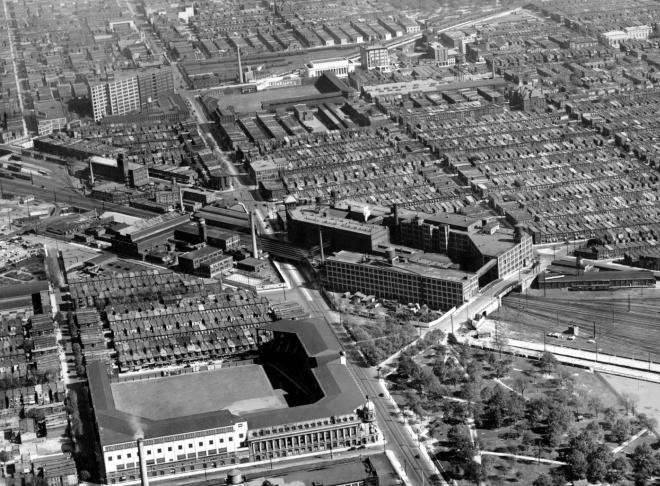 If you knew everything above, you would never have asked the Williams/DiMaggio question in the first place, because you would realize that Fenway is a hitters' paradise, even for lefties, and you would realize that Williams did not meet our expectation for Splinter-like success at Yankee Stadium. Williams' career totals would have been significantly diminished if he had played in the Bronx. The mental picture we have formed of Ted Williams' hitting abilities is there because of Fenway, not in spite of it. 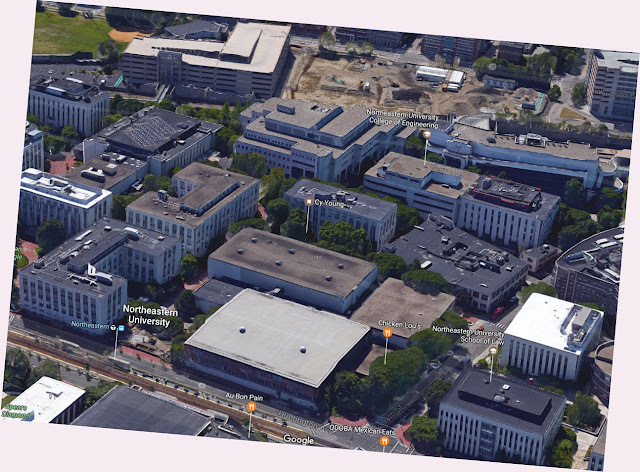 The hypothetical move is relatively easy to approximate. We will give him the number of plate appearances in Yankee Stadium that he had in Fenway and vice-versa, while keeping his performance per plate appearance constant with what he actually accomplished in those parks. We will leave his performance in all other parks untouched. Note that this extrapolation assumes that Williams would have the same number of plate appearances in the Bronx as he actually had at Fenway. That would not have happened in reality. He would have had fewer plate appearances if his home games had been in Yankee Stadium because there are fewer hits and runs there than in Fenway, hence fewer total plate appearances for everyone. (In the course of his career, Williams had 712 plate appearances against Yankee pitching at home, but only 639 at Yankee Stadium, but I don't know how much of that is attributable to run scoring and how much was created by management decisions.) If I were to adjust for a presumed decrease in home plate appearances, and a corresponding increase in road appearances at Fenway, all of his lifetime percentage stats would be a little bit higher in the "projected career" shown above because he would spend a greater percentage of his time in more favorable offensive environments. On the other hand, the counting stats would be lower because of the reduced number of opportunities. He might never have hit that 500th homer if he had been a Yankee. 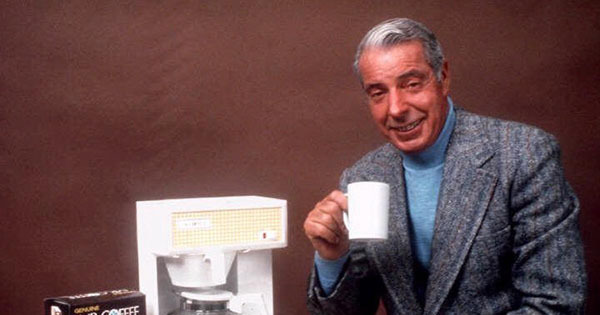 And what about Mr. Coffee? If you've been paying attention to the above, you undoubtedly realize that any right handed power hitter at Yankee Stadium would have profited from a move to Fenway Park, although the massive difference in the dimension of the parks in left and left center would be mitigated slightly by the steady diet of right-handed pitchers who take the mound at Fenway. Joltin' Joe's line at Yankee Stadium was .315/.391/.547 as compared to .334/.410/.605 at Fenway. The difference can be summarized by just two transpositions, and they both make perfect sense. DiMaggio made 10 more outs at Yankee Stadium, and hit 9 fewer homers, so 9 or 10 of his Yankee Stadium fly-outs would have left the park in Fenway, precisely what we would have predicted from looking at the dimensions of the two stadiums. DiMaggio hit four more doubles at Fenway, but 5 more triples in the Bronx. This again is completely consistent with what we would have expected, since a lot of liners in the gaps would hit the fence in Fenway and bounce back to the fielders, but would just keep rolling in the vast confines of center and left center in Yankee Stadium. His rates for singles and walks were nearly identical in both parks. 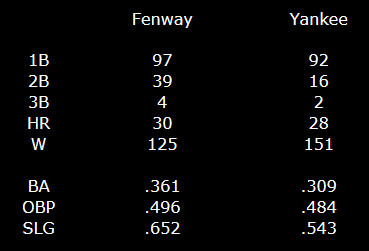 Performing the same extrapolations used for Williams creates the following projections for DiMaggio's hypothetical career with Fenway as his home. If Ted Williams and Joe DiMaggio had swapped home parks, it would have worked out very well for DiMaggio, but not for Williams. As a result of DiMaggio improving while Williams declined, the theoretical swap would have resulted in DiMaggio finishing with a higher career batting average than Williams (.333 to .322) and a higher slugging average (.604 to .587). DiMaggio would also have picked up some 50 additional home runs. Williams, however, would still have the higher OPS by more than 50 points, thanks to a massive difference in on-base percentage (.476 versus .406 ). 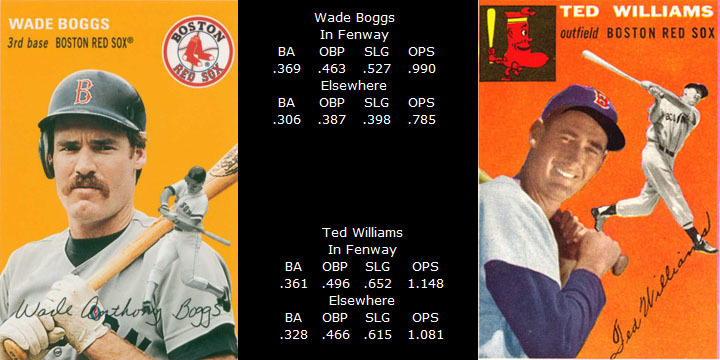 That would still leave Ted Williams with an hypothetical edge of 122 points in OPS, compared to his actual of 139. That leads us to believe that DiMaggio is slightly closer to Williams than their career OPS numbers would lead one to believe.